Roy Moore speaks at a campaign rally on September 25, 2017, in Fairhope, Alabama. As it turns out, Alabama Republican voters could not be dragged to the polls to keep their appointed U.S. senator in his position by a presidential appearance, a vice-presidential appearance, support from the Alabama business community, or $15 million or so in advertising. In a low-turnout special-election runoff on Tuesday night, State Supreme Court Chief Justice Roy Moore beat incumbent Luther Strange handily. Terrible turnout numbers and an apparent backlash against Strange’s elite supporters have lifted the intensely conservative “Ayatollah of Alabama” to a win that makes Democrat Doug Jones viable overnight in a December general election. Luther Strange won his home base county of Jefferson (Birmingham) and adjoining Shelby County, along with Madison County (Huntsville), where the president appeared with Strange last Friday. But for the most part, the rest of the state was Moore Country: He won with 54.6 percent to Strange’s 45.4 percent, with all precincts reporting. Even where Strange did well, turnout numbers do not indicate the kind of Establishment conservative surge that the presidential and vice-presidential appearances and all those pro-Strange, anti-Moore ads were designed to produce. It’s clear Strange’s strategy of making the runoff election all about Trump’s endorsement — and partly about Moore’s alleged swamp-creature persona — did not work. Strange never overcame suspicions that former governor Robert Bentley appointed him to avoid investigation by the attorney general’s office, or that Mitch McConnell massively backed Big Luther to keep a supine supporter in the Senate. The grand irony is that if Strange indeed reached a corrupt bargain with Bentley, it wasn’t what he bargained for, since he was originally appointed to serve in the Senate until November of 2018, before Bentley’s successor Kay Ivie called the earlier special election for 2017. He didn’t get much of a deal. 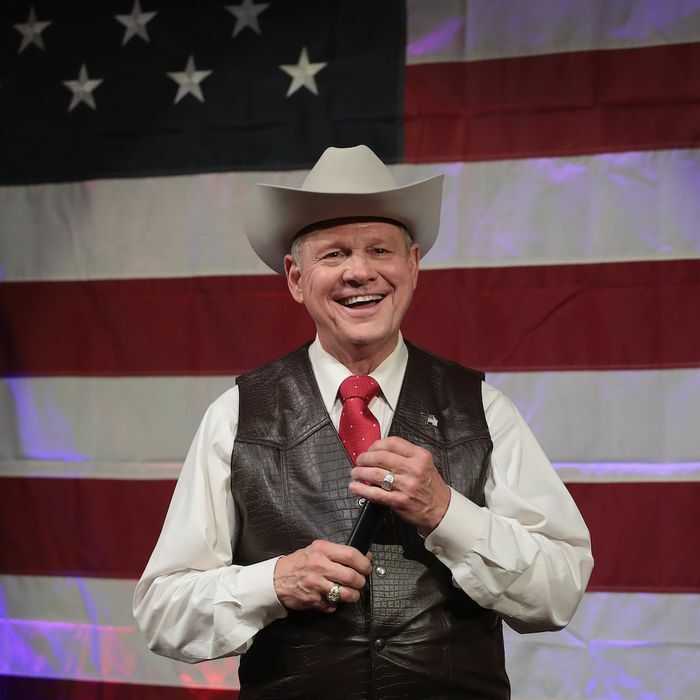 The president has already promised to campaign for Moore in advance of the December general election, which now, despite the profoundly Republican nature of Alabama, is competitive. But Trump’s perceived electoral clout in a state where Republican voters adore him has not been impressive.